The Crazy Color Semi-Permanent Hair Dye 4 Pack 100ml in Aubergine is a great way to get an incredibly cool new look! Secure yourself a glittery and glamorous new look with the Crazy Color Semi-Permanent Hair Dye 4 Pack in Blue Jade! Grab yourself a gorgeous new hair colour that'll make you feel all bubbly inside! 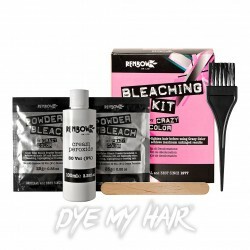 The Crazy Color Semi-Permanent Hair Dye 4 Pack in Bubblegum Blue is a great choice!